Djamra are a bass/sax/trumpet/drums quartet from Japan that play a high energy, rockin' brand of instrumental jazz and avant-progressive rock. "Time Flies Like An Arrow (2 hones)" opens the set and features Djamra at their most standard jazz based, but with moments of the powerful rock edge to come. Masaharu Nakakita's bass and Akihiro Enomoto's drums are a potent rhythm section, and Nakakita's playing easily handles the role of a guitarist. The two create a formidable offensive over and against which Dai Akahani's trumpet and Shinyi Kitamura's saxophone create a dual free-wheeling horn assault. Other highlights include "Neo Skin" and "Time Flies Like An Arrow (3 hones)", both genuine smokers with monstrous funk bass and moments of thrashing chaos. Among my favorites of the set. Guests Yuzi Hazima and Pinta spice things up with guitar and keyboard contributions on "Mood" and "Hz", the latter having some of the most hair-raisingly wild jams on the album. Equally off in mercury bursting freakout land is "The Cave". HOT!! "Nest" is a high energy tune that parades through a stream of themes that are equal parts power prog, mellow passion and whimsical fun. Most of the tracks are in the 4-6 range, though at nearly 16 minutes, "To India" is the epic of the set. In some ways this is like an extended version of "Nest", bouncing from one theme to the next, often with a sense of high powered playfulness, sporadic hints of psychedelia, and much more. In summary, fans of horn driven but power rocking progressive rock and jazz will be impressed with Djamra's instrumental prowess and adventurous compositions. These guys can really jam with a free-wheeling let-yer-hair-down feel... but at the same time being completely in control. Recommended. 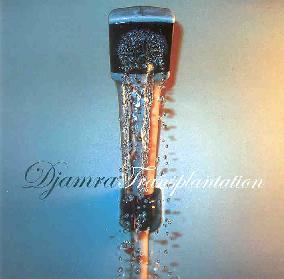 For more information you can visit the Djamra web site at: http://www.djamra.com. Transplantation is distributed by Musea Records. You can visit their web site at: http://www.musearecords.com.